Tolkien probably never got around to working out how to translate the phrase â€˜blatantly had it comingâ€™ into Elvish, back in the day. 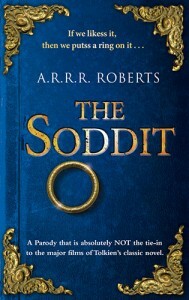 But if he had, it would surely have been put to good use by sci-fi author Adam Roberts in this hardback re-issue of his 2003 parody of The Hobbit. The literary excesses of Tolkienâ€™s often over-cluttered passages lend themselves well to humour of a sort, and from the very first pages, Roberts engages in a full-on rearrangement and refocusing of the original text into something more resembling a Marx Brothers movie. Character and place names are altered as a matter of course, forming a deluge of puns and one-liners, some more funny than others. In addition, Roberts puts footnotes to excellent use as a delivery system for his own distinct narrative voice alongside that of the story, thereby allowing him to poke yet more fun at Tolkienâ€™s penchant for digressing into the detailed history and background of his universe. Whilst all this slapstick humour and irreverence is initially fun, you canâ€™t help but feel yourself craving something a little more substantial by the time you reach the halfway point of the book. Thankfully though, it as this point that Robertsâ€™ story sensibly begins to deviate from the original book more and more, heading off in an entirely different direction for its perhaps slightly hurried conclusion. Whilst not adverse to a little Pratchett or Fforde from time to time, Iâ€™m not what you might call a serious fan of fantasy humour and where I feel Robertsâ€™ approach works perhaps less well than othersâ€™ is in his sometimes too light-hearted approach to the text. Though you may certainly enjoy reading The Soddit, youâ€™ll never quite forget that you are at all times reading a parody, as opposed to losing yourself in something absorbing, which also happens to be funny.